A version of this recipe was the first seafood dish I ever served to company when I was newly married 18 or so years ago! I have given this recipe away countless times since and my mother-in-law just mentioned that she cooked it for guests to rave reviews. In the original recipe, I used all mayonnaise. Over the years, however, I started to cut the mayonnaise in many recipes with Greek yogurt. The substitution can be made in proportions that maintain the flavor of a recipe while improving the heath profile by decreasing fat and increasing protein, calcium and other nutrients. I am often asked if Greek yogurt can be substituted for all the mayonnaise so, sometimes, I try. Generally speaking, a 50-50 mix is safe. In the case of this salmon recipe, I made it with all Greek yogurt and increased the Parmesan by one tablespoon. The flavor was tangier than the version with mayonnaise and did not brown quite as much, but I liked it, as did my family. Of all versions of this recipe I have concocted over the years, however, my favorite way in the recipe which follows. It is creamy and just a bit tangy and so completely easy to prepare. This dish is easy enough for a quick weeknight meal and altogether fancy enough for entertaining. The Parmesan mixture can even be made ahead and spread on the fish just before baking. Combine the Parmesan mixture ahead of time to make quick work of dinner. The recipe can easily be multiplied to feed a crowd. In a small bowl, stir together the yogurt, mayonnaise, Parmesan, chives, Worcestershire sauce, and pepper. 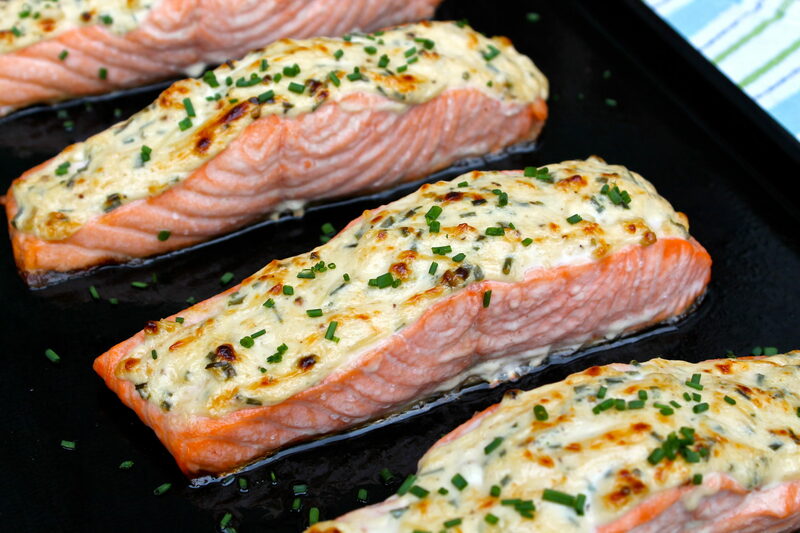 If the salmon is skinned, place the fillets on a lightly greased baking sheet. If not, see the note below. Spread mixture evenly over top of the salmon fillets. Here is an easy way to remove the skin if you purchase the salmon that way: Cover your baking sheet with foil and do not grease. Place the salmon, skin-side down, on the foil-lined sheet and cook as directed. When cooked, simply run your spatula between the fish and the skin. The skin will stick to the foil and you can scoop the cooked fillet right off. Makes for quick clean-up of the tray, too! 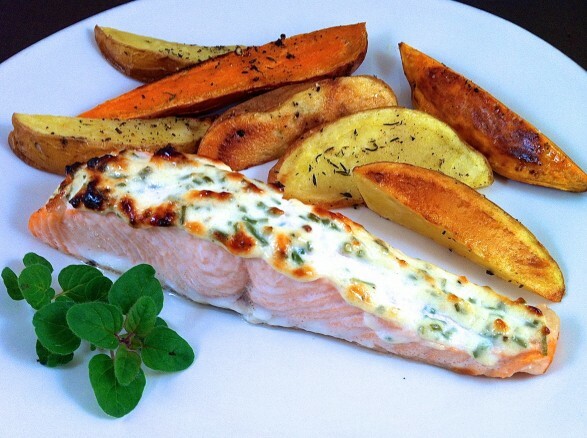 The salmon is served here with Roasted 2-Way Potatoes. This is a long-standing favorite in our house, Terra. Thanks for the great comment! You are very welcome, Jocelyn. I hope you enjoy! Salmon is my favorite, too, Beverley! I could eat it every night. Thanks so much for the thoughtful comment, and dive away! I am with Terra and Beverly! Parmesan crusted love indeed!! Need to put salmon on my grocery list for sure. I’m always looking for new ways to grill salmon. This looks perfect and so delicious. I’ll be giving it a try next time. Thanks for sharing. You are very welcome and I hope you enjoy, Griffin. For some reason, I always bake this recipe but I think it would be fabulous on the grill. Feel free to report back! Thank you very much for the terrific feedback! I am so glad you enjoyed was has been a longstanding favorite in our house! Made this today and it was delicious!!! It’s a keeper for sure 🙂 Thanks! So glad it was a hit, Lisa! Thank you for letting me know! Ann, I saw read your interview on Ally’s Kitchen and thought, “What an interesting life — and person!” Soooo much past and present love wrapped up in your thoughts and cooking! That’s the fun part isn’t it? Living the memories and making your own! Terrific salmon recipe, too! Thank you for your thoughtful comments, Kimby! I am so glad you found me through the ever-fabulous Ally and hope you visit again soon! How many fillets is that recipe for? The recipe calls for four six-ounce fillets which totals one and a half pounds. You could make six four-ounce pieces or any amount you like. The topping is plenty for 1 1/2 pounds of fish. Hope that helps! Have salmon thawing for tomorrow night and this is what I’m making! Now my question for you Ann, is this… Do you ever fix beets? And if so, what is your favorite way to fix them? Hello Mary Lou! I love beets and my favorite way to prepare them is to roast them. I peel them with a vegetable peeler, cut into chunks, and toss with a little olive oil, salt and pepper. I often roast along with other root vegetables. Roasted beets are also delicious in a salad with feta cheese, walnuts, and mixed greens. You could even add some orange segments and drizzle with a simple vinaigrette or some syrupy balsamic. I hope that helps. It sure sounds like a delicious dinner is in store! Thanks Ann! I was browsing your site and found a recipe for roasted root veggies with a maple vinaigrette I think I might try. I have carrots, beets and sweet potatoes so it will be perfect. That salad sounds like it is right up my alley too! You found one of my favorite recipes, Mary Lou! I adore that salad and love using the dressing on roasted veggies. For some reason, I didn’t think to mention it in my last response. Let me know what you think…and how the beets go over with your husband! Made this salmon dish last night and it was Deliious!!!! Thanks for sharing the recipe! My pleasure, Lynda! So glad you liked the recipe, and thanks so much for letting me know! Oh, my this sounds delicious, can’t wait to make it!! Thanks for sharing!! You are welcome, Tami. Hope you love it as much as we do! Thank you for sharing your recipe on Foodie Friends Friday! This recipe looks very tasty…can’t wait to give it a try! Thank you for the reason to share and for popping over my way, Kelly! This was the best dish ever. My husband really enjoyed it. It was very moist. So glad that it was a hit Melissa! Thank you for the information and the kind remark, Gunsu! Made this tonight for my husband. Served it with roasted asparagus, which I placed on the same pan. It was DELISH! THANK YOU. Will definitely serve for company. Yay, Paulette! This recipe is a long time favorite in our house and I am so glad it was a success in yours! I made this recipe a couple of weeks ago and loved it, but I am supposed to avoid dairy. Tonight, I used dairy-free versions of the mayo, Parmesan and sour cream (for the yogurt). I also substituted dill for the chives. It was really good. I am glad the non-dairy version worked so well, Deborah. Thank you for the great feedback! Very good on thinly sliced chicken breasts as well! Yummy! Can’t wait to try on salmon. Thank you for the great suggestion, Sarah. The topping would be delicious on chicken, too! I’m not sure what I did wrong but the parmesan topping ran all over the pan. I did salmon and chicken, it looks good, just not sure why its runny. Made this tonight and I loved it! I have never used Greek yogurt in my cooking in place of something and it gave it a tangy yet subtle taste. Thanks for the recipe, I will def be making this again. I am thrilled you enjoyed this, Jessica! Thanks so much for letting me know! Can this be done with frozen fillets as well? I’m not too experienced cooking fish. If I thaw frozen ones, will it turn out just as good? Thank you! I don’t often use frozen fish, but if the fish was frozen early on and has not been in the freezer too long, it should be fine. I have heard you can bake frozen fillets, although I have not tried this. (This would add to the overall cooking time.) For the first time, I would thaw, pat dry, and proceed with the recipe. I hope you enjoy! Thanks for the info! It was bought frozen and bagged, in the frozen section of the grocery store. I am assuming this would be better with fresh fish. You may be pleasantly surprised. If you think about it, let me know how it works out! My pleasure, Carrie, and you, too! This recipe is DELICIOUS!!! The parmesan topping makes a great dip, too! Yay! I am thrilled you enjoyed and love the dip idea! I made your Parmesan salmon filets last night and OMG, they were delicious!!! I found your recipe on Pinterest. I’m making it right now with a side of mashed potatoes. This smells phenomenal! Thank you so much for sharing this recipe. I will make this the next time I invite my in-laws over. I am so glad you found this, Kendall, and I hope you enjoyed the taste as much as the aroma. This recipe has been a favorite here for a long time, so I was very happy to share it! Yes, Fran…you may simply use all mayonnaise. In this case, you may choose to add a small squeeze of lemon juice to replicate the hint of tang the yogurt provides…but you don’t have to. Hope you enjoy! What an awesome recipe. My fish-hating boyfriend loved it. Thank you. This will definitely go into our rotation….and SO EASY! Yay…that is great, Katy! Thanks for the terrific feedback! Excellent recipe! Made it for dinner tonight and it was divine! I have made this several times since I found your recipe on Pinterest…fabulous! !… I bake from frozen, 425 degrees for 30 – 40 min. and it’s fine…thank you for good food!! I am so glad, Bonnie, and appreciate the feedback on cooking with frozen fillets! I am so glad you like the recipe, Jo, and I have never actually had Australian salmon. The topping could be used on other fish. White, flaky fish would be a good choice, too….salmon is just my personal favorite! Love this recipe! I’ve been making a version of this topping for many years and it works nicely on white fish and chicken too. I sometimes sprinkle some Italian bread crumbs on top and/or mix in some chopped capers. A favourite in our house and I’ll definitely be trying it with the 50/50 mayo Greek yogurt mix. Thanks for the great idea! I hope you enjoy the new version, Janice. Thank you for your comment! This was really good!!!! Just made it! I made this last night and it was delicious!!! Thanks for sharing! Made this last night and it was enjoyed by entire family ! Thank you for another great recipe which I will definitely make again . The tip for getting the skin off the salmon (or rather, the salmon off the skin) is the best cooking tip I have ever received!! Scrubbing salmon skin off the bottom of my pan was always my bane, and getting it mixed in with the fish was just the worst. Now I don’t have to worry about either ever again! It’s amazing how one small annoyance can keep us from making something we otherwise enjoy. Enjoy the tip and the salmon! We have salmon once a week, with the parm/mayo combo. I’m excited to lighten up this recipe! Thanks! I hope you enjoy it as much as we do, Lianne! Why would you remove the skin????? Tons of super healthy nutrients in that skin. I’ve mentioned in other salmon recipes–but not this one–that I eat the skin when the fish is wild because it does contain many healthy nutrients. The skin of farmed salmon, however, as well as the fatty layer just below it, contains higher levels of PCBs, so I tend to not eat it in this case. Thanks for your comment, Wallace. We don’t particularly care for salmon though we love catching it and we do have it all the time, so I am always looking for a recipe that works for us. This one is the best yet! Fast and ingredients always on hand and tastes really, really good! And looks good enough for company and company loves it, too. 5 stars for this one. Yay! Thanks for your terrific feedback, Jonna. I’m thrilled this was a hit and love that you catch your own!